Pereira found the back of the net to ensure an unassailable 2-0 lead in the dying minutes of the match and a place in the Mumbai Divisions. The winning Fr. Agnel team, led by Shaun Veigas, won the Navi Mumbai District Under-14 Boys Subroto Cup Football tournament. Fr. 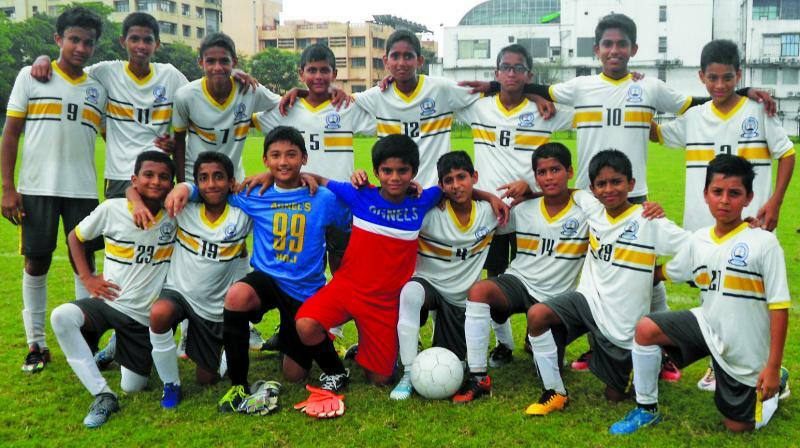 Agnel Multipurpose High School, Vashi rode on late goals from Harsh Negi and Reagan Pereira to defeat St. Augustine High School, Nerul 2-0 in the final of the Navi Mumbai District Under-14 Boys Subroto Cup Football tournament. After a goalless first half in the summit clash at Yashwantrao Chavan Playground in Nerul, Agnel’s broke the deadlock on the counter after a through ball by Reyansh Shah from the centre found his team mate Negi deep inside the opponent half. Desperately in search of an equaliser, St. Augustine pressed more players up, only to find their efforts undone by yet another long range clearance from inside Fr. Agnel’s half. Mohammed Hassan on the left flank neatly trapped the floater on the run and passed it on to his team mate, Pereira, after outpacing two Augustine defenders. Pereira found the back of the net to ensure an unassailable 2-0 lead in the dying minutes of the match and a place in the Mumbai Divisions.